James Kirk's failure to obey the Prime Directive has reduced a planet to a post-nuclear horrorscape...or is a far more sinister force at work? Featuring a dramatic reading by James Doohan, and enhanced with sound effects and an original score! On a planet code-named Gateway stands a mysterious portal to the past, the Guardian of Forever. Spock, Kirk, and McCoy have just returned from a voyage through the gateway with a young man named Zar - Spock's own son from ancient Sarpeidon! But while Spock and the brilliant, primitive youth try to bridge a gap of centuries and cultures, Gateway is seized by the Romulans. The Enterprise must destroy the planet rather than let the Romulans use the past as a weapon - and Kirk has 12 hours to find a way out. Only Spock and Zar have any chance of penetrating the Romulan forces on Gateway. Suddenly, father and son are plunged into a fierce fight for their lives - and a battle to keep the Romulans from fatally changing the past! 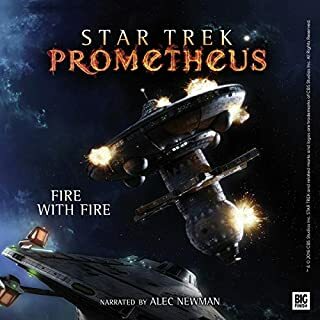 Featuring a dramatic reading by Leonard Nimoy and James Doohan, and enhanced with sound effects and an original score! I’ve recently been catching up on Star Trek books that I missed as a teenager. 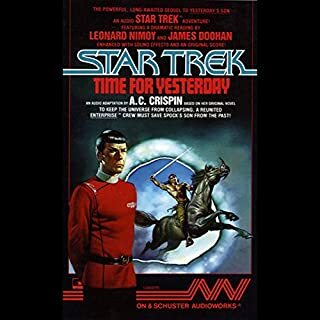 This is — in part — a continuation of the penultimate episode of The Original Series, “All Our Yesterdays.” With James Doohan narrating and Leonard Nimoy voicing several internal monologues by Spock, Yesterday’s Son (1983) feels like a hidden episode of TOS. 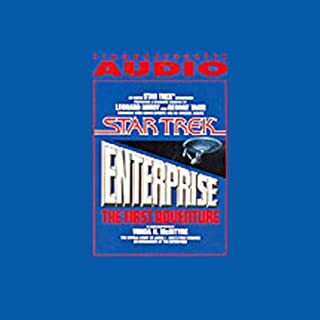 For Trekkies, a fun audiobook. This was a great book, and great follow up book, I really wish they could've made these as special episode. It would have been great. I recommend this book and the follow up. 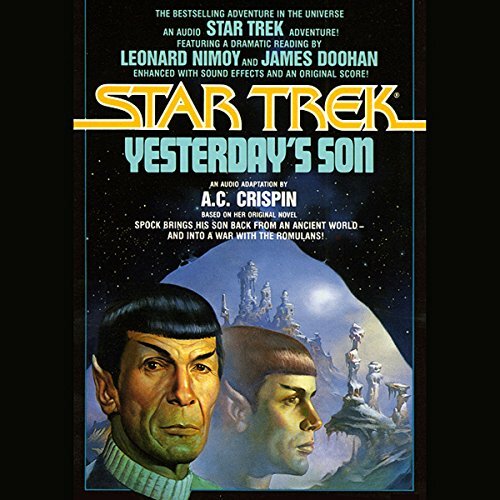 Would you listen to Star Trek: Yesterday's Son again? Why? Yes, It was a very interesting story with good narration. Leonard Nimory and James Doohan had extra charm and excitement to the story. Spock went back in time to save a son that he conceived with a woman that he met when he traveled to the past. 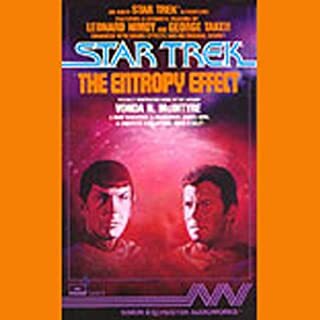 What does Leonard Nimoy and James Doohan bring to the story that you wouldn’t experience if you just read the book? Excitement, Charm, and increased enjoyment. Yes, I wanted to hear the end of it, and it was a short story. 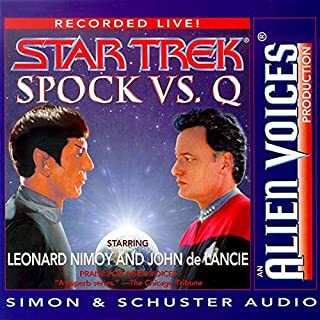 I enjoyed hearing James Doohan and Leonard Nimoy perform this quasi audio drama. The story was only so-so. I guess my biggest problem is that so many of these canon adjacent stories are just kind of weak. Since nothing permanent is ever allowed to happen to any of the main characters, nothing of consequence ever actually happens. It leaves the story toothless. Additionally, the imitation Star Trek synthesizer score is just plain painful to listen to. It's affordable comfort food, but don't have high expectations for character development or plot. What did you love best about Star Trek? I love star trek and Spock is my favorite character. This book is part one based on an episode from the original series. Spock discovered that what happened in the past had consequences and he got something he didn't know he wanted. What other book might you compare Star Trek to and why? There is no other book I can compare Star Trek to unless it is one of the spin-offs of the original series. 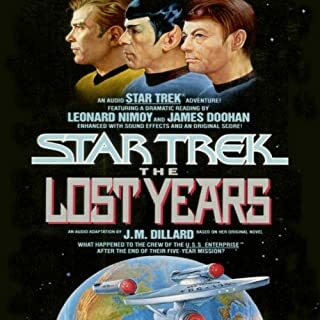 What about Leonard Nimoy and James Doohan ’s performance did you like? When Spock told Zar that he was proud of him. This book and the next one is a must for the Star Trek fan. I loved how they continued a story from one of the better episodes in the original series. Which character – as performed by Leonard Nimoy and James Doohan – was your favorite? I love to listen to Leonard Nimoy. He had the coolest voice. Loved it when I read it, and Loved it when I listened to it.